Seed Oils | Just meat. PUFAs are fatty acids that have two or more double bonds in each molecule. There are two types of PUFAs in dietary oil: omega-3 and omega-6, also known as ω-3 and ω-6. They are distinguished by the position of the first double bond. Omega-3 fatty acids have their first double bond at the third carbon atom from the methyl end of the carbon chain while omega-6 fatty acids have their first double bond at the sixth carbon atom from the methyl end. Structural representation of ALA Figure 1. Structural representation of ALA (ω-3) and LA (ω-6), two essential fatty acids and the most common PUFAs found in dietary oil. The red numbers represents the carbon atoms counting from the methyl end of the chain. The blue counts from the carboxyl end. The most common omega-3 fatty acids in the human diet are ALA, EPA, and DHA while the most common omega-6 fatty acids are LA and AA (Table 1). The omega-3 fatty acid ALA and the omega-6 fatty acid LA are referred to as essential fatty acids because the body cannot synthesize them. Essential fatty acid deficiency can lead to dermatitis, stunted growth in infants and children, increased susceptibility to infection, and poor wound healing. In human cells all long-chain omega-3 fatty acids are synthesized from ALA and all long-chain omega-6 fatty acids are synthesized from LA. Increases in the ratio of n-6 : n-3 PUFA, characteristic of the Western diet, could potentiate inflammatory processes and consequently predispose to or exacerbate many inflammatory diseases. The change in ratio and increase in n-6 PUFA consumption change the production of important mediators and regulators of inflammation and immune responses towards a proinflammatory profile. Chronic conditions such as CVD, diabetes, obesity, rheumatoid arthritis, and IBD are all associated with increased production of PGE2, LTB4, TXA2, IL-1β, IL-6, and TNF-α, whereby the production of these factors increases with increased dietary intake of n-6 PUFA and decreased dietary intake of n-3 PUFA. In conclusion, the unbalanced dietary consumption of n-6 : n-3 PUFA is detrimental to human health, and so the impact of dietary supplementation with n-3 PUFA upon the alleviation of inflammatory diseases, more specifically, NAFLD needs to be more thoroughly investigated. Metabolites of arachidonic acid and linoleic acid in early stages of non-alcoholic fatty liver disease–A pilot study. 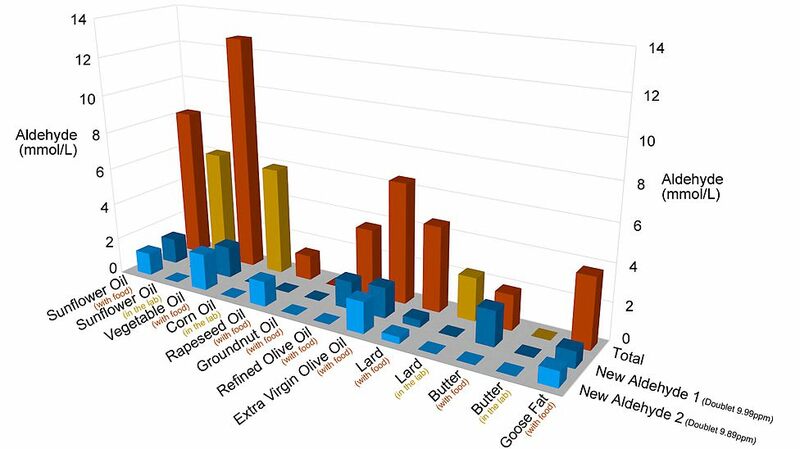 Oils for cooking: Evaluation of Chemical and Physical Changes in Different Commercial Oils during Heating This study reveals that, under the conditions used in the study, smoke point does not predict oil performance when heated. Oxidative stability and UV coefficients are better predictors when combined with total level of PUFAs. Of all the oils tested, EVOO was shown to be the oil that produced the lowest level of polar compounds after being heated closely followed by coconut oil. N=1 experiment of switching to a high omega-6 intake for 30 days. Do Vegetable Oils Raise Heart Disease Risk?